Visiting a new city, or maybe just a part of town you’re unfamiliar with? If you’re concerned you may forget where you parked your car (or bike, mule, horse, chariot, whatever), just pull out your iPhone at that location and use the Maps app to save the location. This simple trick means you’ll never forget where you have parked ever again, even if you’re in a place you have never been before. That’s it. Now go about your business as usual, be it in a foreign city or a familiar one, and never be concerned about getting lost or forgetting where you parked again. Once you need to get back to your transportation, just relaunch the Maps app and zoom out until you see the pin on the map again, which you just need to walk to. Nice huh? Relocating your car/mule/bike at the pinned location is often made easier by orientating the maps app so that it points to the direction you are physically facing. That is done just by tapping on the arrow button again so that maps orients with you, rather than to the default directional setting of pointing north and south. 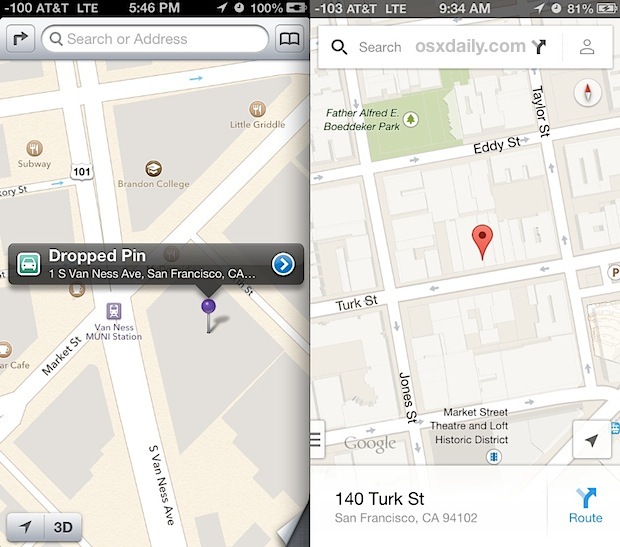 This trick works in both Google Maps and Apple Maps apps in the same way, as dropping pins and the accompanying relocation services work the same in either app. If the location you’re visiting or parked at has poor cellular reception, using Google Maps may be a better choice because of it’s offline caching feature. This trick is incredibly helpful when visiting cities and regions you are unfamiliar with, and you’ll never have to worry about finding the proper parking garage or train stop again. Thanks to Erika for the great tip! Note: For iOS 8x, tap the locate button, then tap the blue dot to select your current location, then tap the information circle icon in the lower right corner of the screen to access a menu of choices. Select “Drop a Pin” and follow the rest of the instructions above. Ok so I know my car is in this location, but it has 9 floors of parking. Can it tell me which floor I parked on? Take a picture of the floor number/parking bay you’re in, very helpfull when parking at an airport.